On Saturday I was summoned by senior lecturer Peter Linde to Lund’s library. 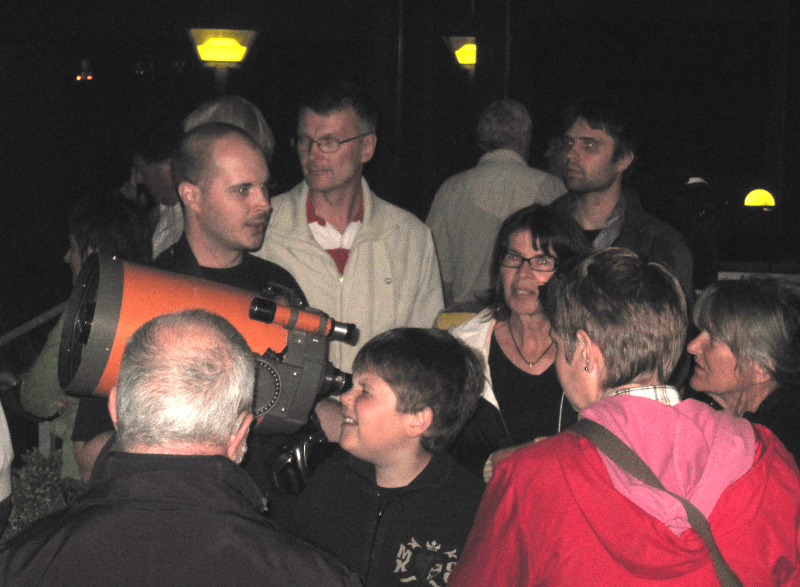 I was asked to assist with the telescope during the cultural night event in Lund. Visitors would come and watch through the telescope which was pointed towards Jupiter and the moons Io, Ganymedes, Europe and Callisto. I was surprised by how many people attended to the library. At the same time we were showing Jupiter on the telescope, Peter held lectures about the possibility in existence of life within our planet system and far beyond. All in all we could estimate around 300 attendees during the evening that lasted from 7 pm to midnight. I was happy to meet that people and share information regarding Galileo, Jupiter and the moons around the planet. This entry was posted in Observation and tagged Jupiter, Kulturnatten, Lund, Niklas Henricson, Stadsbiblioteket.